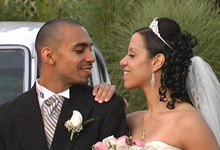 Every wedding videographer wishes for an eventful day with lots of action to capture. Maria and Ervin’s wedding day certainly provided many wonderful moments to document. After exchanging vows at the elegant Leonard’s catering hall of Great Neck, they danced the night away in a spacious ballroom of this beautiful venue. We applied some slow motion effects to freeze the amazing dance moves. This clip demonstrates some of the cinematic effects and editing techniques we use for our long island wedding videography packages.